…none, yet, but a popular Japanese sports drink is hoping to be the first. 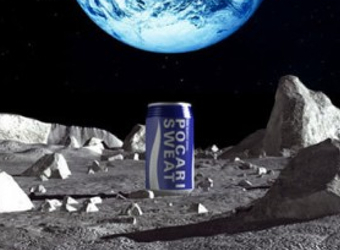 Pocari Sweat* is sponsoring an entry into the Google Lunar X Prize, allowing it exclusive product placement rights. The Google Lunar X Prize will give US$20 million to the first privately-funded moon landing that drives a robot 500 metres across the Lunar surface while capturing HD video. Brands in space is not a completely new thing. Red Bull jumped from space, and Pocari Sweat has been enjoyed by cosmonauts aboard the International Space Station. This latest venture, however, will go all the way to the moon and carry a rather peculiar branded item. The Lunar X Prize team involved is called Astrobotic, and for a rumoured half a million US dollars, its Griffin Lander (which will get to the moon aboard Elon Musk’s Falcon 9) will carry a special can of Pocari Sweat. 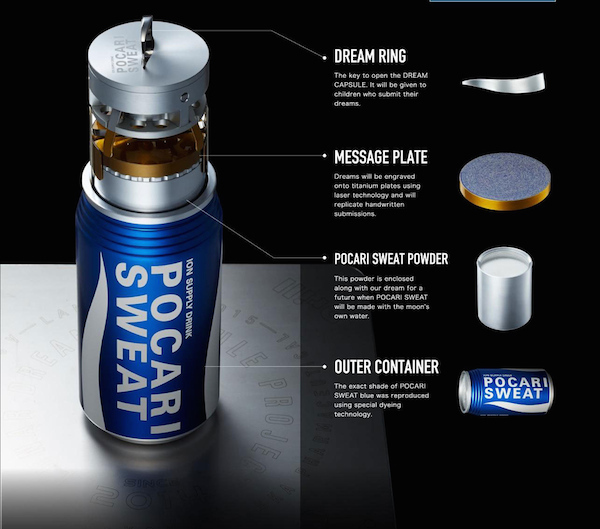 The special can, called the ‘Dream Capsule’ will contain Pocari Sweat powder and a message plate, and can only be opened by a ‘Dream Ring’, which will be given to children who submit their dreams to be included in the capsule. We’ve watched the video below and are deducing that the aim here is that those kids will one day travel to the moon and open the capsule so they can whip up some Pocari Sweat (because Lunar golf is thirsty work). The reference to sweat in the name of the beverage tends to have a certain off-putting or humorous connotation for native English speakers. However, the name was chosen by the manufacturers originally for the purpose of marketing the product as a sports drink in Japan, where English words are used differently. It was largely derived from the notion of what it is intended to supply to the drinker: all of the nutrients and electrolytes lost when sweating. The first part of the name, Pocari, does not have any meaning; the word was coined for its light, bright sound.